I am so excited to announce that my e-cookbook, One For You And One For Me is now available! Do you have a furry family member, or do you know someone who has? Then this ebook is a must! New recipes that have not been published on my blog. Have you ever been eating a yummy dessert when your furry family member comes into the room with nose sniffing the air? You try to explain that this dessert is not good for them because it contains chocolate, nuts, or a whole list of harmful ingredients that dogs shouldn't eat. Wouldn't it be nice to share your dessert with your furry family member? With these recipes you can. Everything in this book has been created with both humans and dogs in mind. Imagine baking delicious, cookies, tarts, ice cream and more that contain safe, wholesome ingredients for dogs and that are equally pleasing for humans. 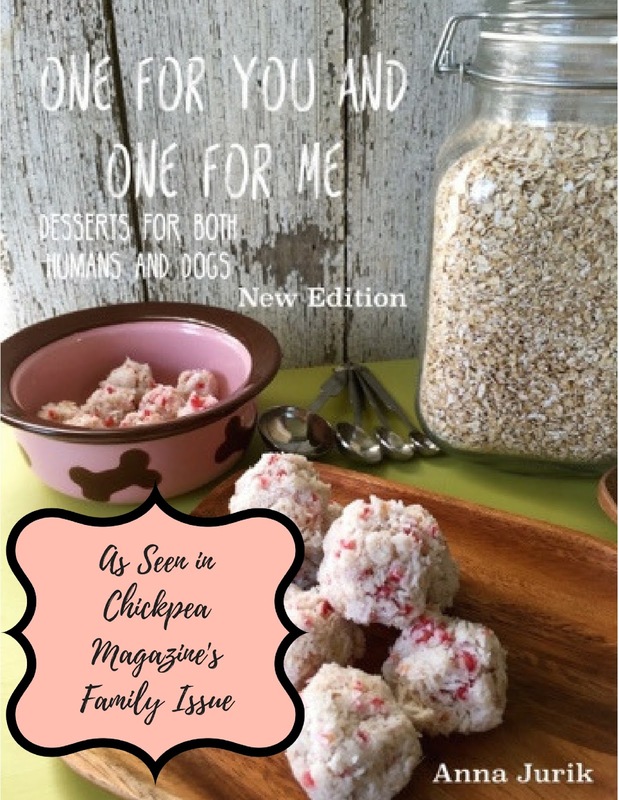 Welcome to the sweet, savory, and scrumptious world of One For You And One For Me: a world where you can make delectable desserts not only for yourself, but also to share with your furry friend. All of these yummy recipes can be quickly and easily executed. No complicated equipment or special baking skills are needed to whip up these goodies. 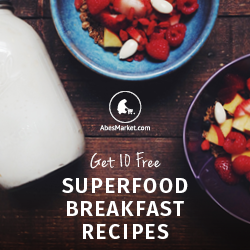 In this second edition you'll find recipes that are gluten-free friendly and ones that can easily be converted to gluten-free by using certified gluten-free oats. In this book you'll enjoy recipes for Cakes, Tarts, Cookies, Ice Cream, and other treats. Sharing what you bake with your furry friend will bring delight to both of your worlds. 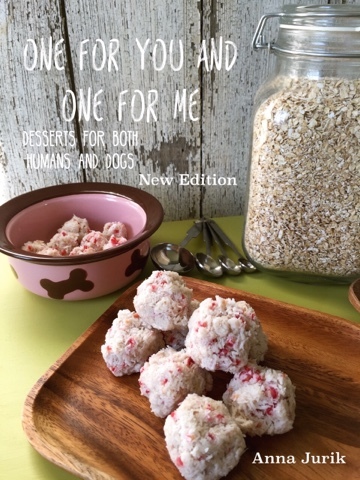 So the next time you are getting yourself a scrumptious dessert and your dog walks in, you can now say, "One For You And One For Me." I am offering this e-cookbook with 20 recipes for $2.99! in a .pdf file. Click on the "Buy Now" button on the righthand side of the page to purchase! 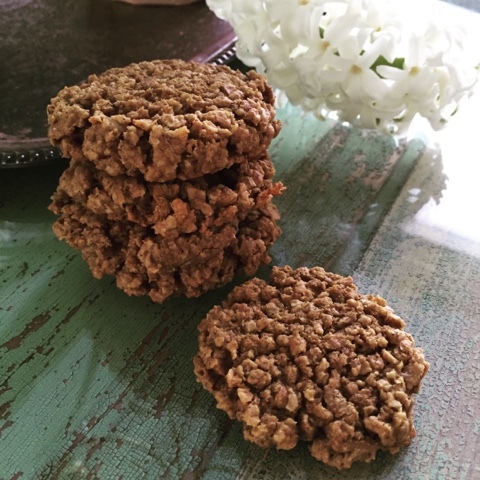 I am always experimenting with flourless cookie recipes. It's a hit or miss method leaving out flour. I've found if you add quick oats your worries are over. The oats give you the bulk that using flour does, and the heartiness of the oats helps keep all your ingredients together. You can easily add vegan chocolate chips or nuts to this recipe also! Line a large baking sheet with unbleached parchment paper, set aside. In a large bowl, mix together the peanut butter and applesauce. Thoroughly mix in the remaining ingredients. If you are adding chocolate chips and/or nuts, add those now also. Scoop up a tablespoon of dough and roll into a ball, place on the lined baking sheet, and repeat with remaining dough. Flatten each ball of dough using the back of a large spoon. Bake 10-12 minutes, the edges should only slightly brown.